New book on Asian Indian Christians in North America! I am delighted to announce that ISAAC has just co-published a new book and resource on Asian Indian Christians in North America! All the credit for this excellent resource goes to Rev. Dr. Anand Veeraraj, Dr. Rachel Fell McDermott, many Asian Indian Christian leaders who participated in the Consultation on Asian Indian Ministries at Princeton Seminary in 2007. The Centre for Contemporary Christianity in Bangalore published the Indian edition [view other CCC publications here]. ISAAC is proud to publish the U.S. edition. For more information and to order on-line, visit http://asianindianpilgrims.com/. I am also posting Dr. Veeraraj’s invitation to two book launching events in New Jersey below. 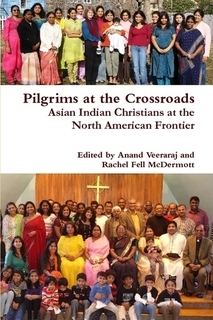 We are happy to inform you that the book, Pilgrims at the Crossroads: Asian Indian Christians at the North American Frontier has been published simultaneously both in India and in the USA. The Indian edition was released on December 23, 2009 at Chennai, India. If you wish to participate in this event, please contact the Presbytery Office. There will be a Fellowship Lunch following the service. We invite you to join us for this happy occasion. You can buy copies of the book at discounted prices at these book events. Please order copies for you, friends and as complementary give away to Pastors and Church leaders. To order copies, please contact the Pastor’s office, ISAAC or visit the following websites. The book is also available on Amazon and in electronic format. Based on this book, we will hold consultations/seminars on “How to multiply Asian Indian Ministries and Congregations in North America.” Please contact the ISAAC or my office for further information. Wish you a blessed 2010.